Options: Single 1/16 oz. Single 1/8 oz. Dozen 1/16 oz. Dozen 1/8 oz. 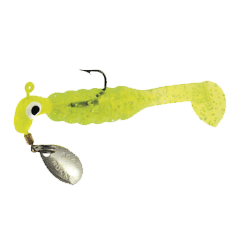 Mr. Crappie's Slabalicious by Strike King features an extra long tail "hinge" for an irresistible action! Available in singles or strip card with 12. 1/16 oz. features #4 hook. 1/8 oz. features #1 hook.